Caulfield Cup 2011 betting, get the best fixed odds or TAB odds now. Caulfield Cup horses, jockeys, barrier draw, results & dividends. Free Caulfield Cup tips. The final field of horses & scratchings for the 2011 Caulfield Cup will be published here first. Free Caulfield Cup race preview, expert analysis of every runner in the Caulfield Cup available on Friday. Free online Caulfield Cup form guides. How to bet on the Caulfield Cup, bet types explained, bet small and win big. Sign up for free Caulfield Cup tips by email newsletter or Twitter. Caulfield Cup winners, history & statistics. Listen live to the Caulfield Cup broadcast online. Tired of trying to bet online with the TAB on Caulfield Cup day? Bet quickly and easily online with Sportsbet by computer or mobile, join here for an exclusive bonus to your new account and bet within minutes. Caulfield Cup, Caulfield Guineas, Thousand Guineas, get the latest racing news and results. This website is operated independently by Australian Racing Report and not by Victoria Racing Club, which conducts the Melbourne Cup horse race, or any official racing organisation. 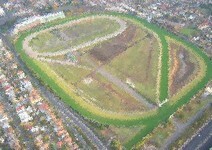 For the official website of the Melbourne Cup & Flemington racecourse, see www.melbournecup.com.au. While care is taken to provide accurate information, Australian Racing Report accepts no responsibility for any errors or omissions in the information at this website. Have fun but gamble responsibly. If gambling is a problem for you call gamblers help on 1800 858 858 or contact your local support services. The media controversy about track bias at Australian racetracks has been raging as long as print and radio journalists have been punting their hard earned cash on favourites - only to see them become the victims of bias and fail to win. So what exactly is track bias and is there anything we can do about it? There are some basic rules which can be applied to all Australian racecourses, but it’s always a good idea to consider things like the distance of the race, the position of the starting gates and the likely speed in the race when assessing the form. Rail is True – the pattern of racing should be fair with equal opportunities offered to those racing on the pace and those swooping from behind. The track rating and likely speed in the race (who is likely to lead and who will sit behind them) is probably the most important factor when assessing the form. Rail is out 4 metres or more – this is more likely to result in a leaders track. The further out the rail is, the more pronounced this becomes. The only track in Australia where this does not appear to be the rule is Sandown Lakeside, which is often a leaders track when the rail is True and a swoopers track when the rail is out. Track rating is Firm or Good – these are preferred track conditions for Australian racing, some horses will only perform on this type of going. Most horses will have their chance and all parts of the course should race fairly. With the primary concern being the safety of the horses and riders a Firm track is rarely seen but can occur on hot days by the late afternoon. Track rating is Soft or Heavy - some horses only excel on wet ground and these are often raced in the winter. The wetter the ground, the more likely it is to favour the on pace runners. Back markers will find it hard work to make up ground in Soft or Heavy going, not to mention getting a face full of mud from the horses in front. Drawing an inside gate and finding the lead early is usually an advantage. After prolonged periods of wet weather, horses will be taken wide in the home straight looking for the better ground. What is Track Bias? Track bias exists at every grass racecourse in Australia, country and metropolitan. It is the result of the layout of the track, the track rating (Good, Dead, Slow or Heavy), the distance of the starting gates to the first turn and the position of the movable inside rail. The only tracks that don’t exhibit any real bias are the synthetic tracks. The Pro-Ride track at Geelong is always rated Good and the rail is always True. It’s also pretty boring from a betting perspective as results can be sometimes be easy to predict, we think this offers limited interest to punters who are looking for an edge over their peers and the bookies. Grass tracks can be more challenging to assess, but finding a winner at big odds because you know what the track bias is likely to be (and most others don’t) can be very rewarding. As well as noting the rail position and track conditions, the length of the final straight at the course is a major factor in determining whether swoopers or on pace or leading will be an advantage. At courses such as Flemington, where there is a long home straight after a wide sweeping turn, it is possible to make ground from behind the leaders even on days when the rail is out. However, at the tighter turning courses, such as Caulfield, Moonee Valley and Rosehill, it is difficult to make ground when the rail is out and this often results in a leaders track. While Randwick has a long home straight, it is susceptible to rain and is often leader biased when rated Slow or Heavy. Let’s take the example of a race at Caulfield over 1400m where the start is positioned just before a turn and the rail is out 6 metres. Those horses who end up racing back in the field and three wide will find it difficult to pass other horses because they will have to travel over more ground being further off the rail than those horses on it. If the track is wet, the leader bias goes up another notch. While they will probably be avoiding the ground near the inside fence later in the day it will still be difficult to make up a lot of ground from the back of the field. You can eliminate horses from your selections who are not likely to start quickly and get to the inside fence before the home turn. Because it can be difficult for punters not familiar with all the Australian city racecourses to assess the likely pattern of racing on a given day, we have provided a page for each course with a map of the tracks showing the barrier starting point locations, a brief comment about the likely bias for each distance and the most favourable barrier draw. These pages also include daily scratchings, weather & track conditions. Go to the Racetracks link in the menu at the top of the page. 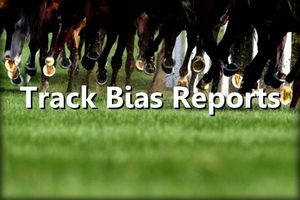 For those wishing to follow the Melbourne & Sydney races we suggest you also check out the Melbourne Track Report for their special report on track ratings and likely track bias which is updated on the day of the races for all city weekend and midweek meetings. Understanding how the track conditions can have a significant impact on the way a track races, knowing which horses will be favoured or disadvantaged can give you a winning edge. Track ratings, rail position and penetrometer information can be a valuable tool for assessing the likely pattern of racing. Before racing commences, the track is assessed in two ways; by racetrack officials walking the track and by readings which measure the firmness of the soil at various points around the course. 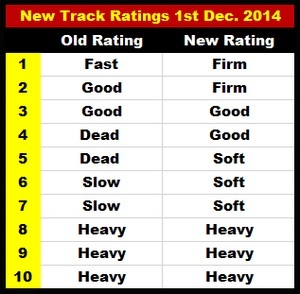 This information is then used to arrive at an average overall rating for the track. Trainers are then given the opportunity to run or scratch their horses based on the early track rating. The rating can change throughout the day depending on weather conditions and when the track is downgraded or upgraded trainers again have the opportunity to scratch their runners. As a general rule, and weather permitting, tracks are prepared to be Good by the time racing commences. Australian Racing Report has the current track conditions & scratchings for all Australian metro racecourses updated on raceday morning, navigate to the course under Racetracks in the top menu for more information. A new system of terms for describing the track conditions was introduced in December, to make the terminology more consistent with that used in other countries. Firm 1 - rarely seen at the metro racecourses, this is a very dry, hard track. Firm 2 - a firm track with reasonable grass coverage. Good 3 - should be suitable for most with a good grass cover and cushion. Good 4 - used to be termed 'Dead', the track has good grass cover and a touch of give but should suit most runners. Soft 5 - a bit more give in the ground but not badly rain affected. Soft 6 - used to be termed 'Slow', the ground is soft but not badly rain affected. Soft 7 - rain affected and the going will chop out, not suitable for horses who like to race on top of the ground. Heavy 8 - a rain affected track that horses will get into and chop out. Heavy 9 - a very wet and muddy track that will be hard work to race on. Heavy 10 - the wettest it can be without actually being saturated.